August has been a wet month, with little passages of lower levels and quieter pools. In terms of catches it has not been a bad month with our salmon total at 85 for the season, but sadly the sea trout catch numbers are well down at only 78 for the season. It has been a strange summer. Daytime temperatures have never gone above 22C and at night have sometimes been as low as 3C, or virtually freezing. Even without the unusually high water levels it would have been a far from ideal night-fishing year, but the combination of high water plus low temperatures made the sea trout very reluctant to take the fly. The best results came from anglers who were prepared to up the size of the fly and get it well down in the water in pools like Indies, Melgund, Haughs and Boat Pool. 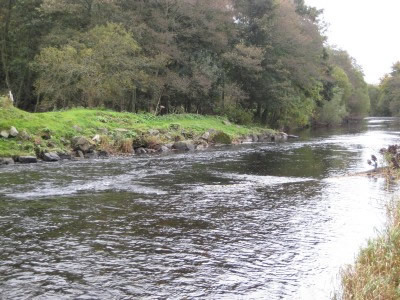 As we enter autumn proper at the beginning of September sea trout fishing is effectively over for 2011, although I note that occasional trout of 2lbs and above are being caught on the Kinnaird Beats downstream of Brechin. Of course the really great thing is that today (31/8) is that the netting season ends. From tomorrow on therefore our salmon and later running grilse will have free access to the river. What is now needed is more rain to keep the water levels at a good height for encouraging fish to run through the lower beats into the middle and upper system. The pattern at this time of year is that, as the autumn wears on and the night frosts start to put a nip in the air and water, the fish move more slowly through the middle river. The effect of this pattern is that further up the river the proportion of silver to coloured fish diminishes. By mid October you would be lucky to catch a silver salmon above Cortachy. At Finavon however I have noticed in recent years that the proportion of fresh to coloured fish changes from about 3:5 to 2:5 during the month of October. 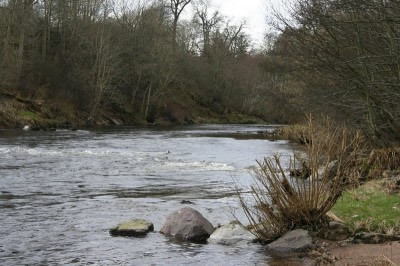 But an awful lot depends on conditions, which is always the case on this little river – not quite a spate river as you find on the Scottish west coast, but not far off with a fining down period after a spate of 2/3 days. We still have some days autumn salmon fishing available in September, but October is looking nearly full. If you want to fish at Finavon the easiest thing to do is to phone Moray on 07835 717 150 to enquire about availability. The last three weeks have marked the transition from early summer to high summer. With water levels now dropping away after nearly two months of relentless rain and fluctuating conditions, the fishing has become quite hard going. However our visiting anglers have done reasonably well by chalking up two or three salmon/grilse and a few sea trout each week. The sea trout runs are more-or-less over for 2011, and the grilse have yet to arrive in any numbers. It is surprising in these circumstances that there are still a few MSW salmon entering the river, and the odd grilse among them. I am hoping that the main grilse run is yet to come, but it is worth noting that traditionally a very high proportion of grilse caught in the South Esk district are killed by the coastal nets (over 85% in recent years). Because the Usan nets are a mixed stocks fishery we have no idea how many of the grilse killed by the nets belong to other rivers on the east coast, and how many to the South Esk itself. Suffice to say that I work on the basis that about 60% of the total catch of Usan nets originate in the South Esk catchment. August is the season’s transition month. By the end of August, given good water levels, we can expect to see some autumn MSW salmon entering the river, hopefully in the company of increasing numbers and quality of grilse. It is only three seasons back that FCW had a catch of 93 salmon and grilse in August. Water is the key, but there also has to be fish in abundance for a catch like 2008 to occur again. As the water has drained away we are seeing brilliantly clear water, every pebble on the bed of the river and, if there were any sea trout left behind, we would also be seeing the occasional small shoal. But, bar the odd old stager spring fish, the occasional grilse head and tailing in the streams and, at dusk, some bigger fresh salmon showing in the pool dubs (Red Brae, Indies, Melgund, Tyndals and Tollmuir Pool), the pools are clear of bigger fish. But every pool and stream shows an abundance of parr, and in the middle of every day there is a frenzied rise of these little fish – the future generations of South Esk sea trout and salmon. There is little doubt in my mind that the river is in good heart and that its main stem and tributaries are providing habitat for large numbers of juveniles of both species. Living on the banks of the River, as I do, the sight of so many young fish gives grounds for optimism, and not a little happiness! The missing ingredient is of course the fish themselves. Judging from the quality and abundance of MSW salmon returning in the last two seasons we have grounds for optimism (yet again! ).